This week everyone is talking about the Danish study linking walking and biking to school with better concentration. 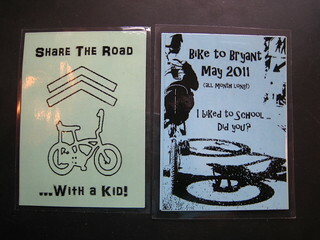 Kids + walking/biking + education = hot topic, right? The story has legs and is making the rounds on Twitter, Facebook, blogs, and news outlets. 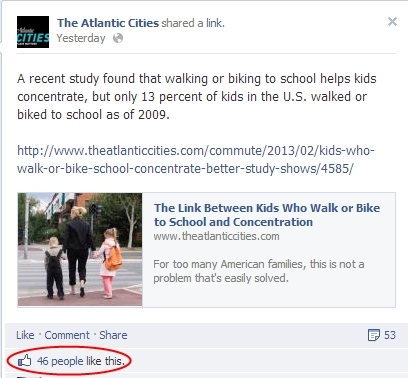 Everywhere we click (at least in our admittedly bike- & walk-centric world), we see a link to the study. You’ve seen it, haven’t you? Like many of you, we get excited about these articles and want to pass the on to our network of friends. The resulting flurry of retweets and likes is a good thing, isn’t it? “Hey look here’s a great story. Let’s share it with our friends!” We click and make a difference. And then …. nothing. For all their worth so many of these stories fade quickly, replaced with the next alt-transpo buzz (like … “e-bikes are coming and they are going to change everything!”). Lately this pattern of enthusiasm then vacuum has us questioning the value of our easy methods of what we call click advocacy. We share a story and we feel better. But does just spreading the word spur change? After reading all these articles, do people actually become inspired to take action? Or do the stories just bounce around among the already bike-and walk-aware, only to scroll off the page like yesterday’s news? Is clicking ‘Like’ actually doing something? We often debate the importance of social media in our house. Tim was an early-adopter. He joined both Twitter and Facebook in graduate school and still grants more credit to the power of network effects than Anne. She was slower to join the social media party, and although she thinks she (mostly) likes it, she still wonders what good it really does. We certainly appreciate the equalizing power of social media. Anyone with an Internet connection can publish their (sometimes nutty, sometimes world shaping) information and ideas. Having a voice loud enough to spur change no longer requires access to a printing press, newspaper, or TV station. Powerful ideas can move from the minds of a few to voices of the masses in a matter of days. Social media can be amazing. But in terms of local advocacy and action, we wonder if this ease of sharing has sometimes driven more complacency than change. When you ‘like‘ something on Facebook or share it on Twitter, you’re letting others know you care about a cause. Awesome. But is sharing enough? Clicking ‘like’ or tweeting or even blogging for that matter doesn’t take that much effort. Do these clicks spark real-life action? Do people look at you and think, “Hey, they’re doing something. Maybe I should too.”? Or do we simply generate noise? The survey looked at nearly 20,000 Danish kids between the ages of 5 and 19. It found that kids who cycled or walked to school, rather than traveling by car or public transportation, performed measurably better on tasks demanding concentration, such as solving puzzles, and that the effects lasted for up to four hours after they got to school. Walking and biking to school improves concentration? And the effects last up to four hours? Holy crap, that’s better than Ritalin. And it’s free (and, it’s not a d-r-u-g)! Go ahead and share, but get involved too! So fine, share all you want. Get people thinking about important topics. But when you come across a story that really matters to you—like this one does to us—take it a step further and DO SOMETHING with your new information. As you are clicking “like” just ask yourself: “is this something really important to me?” And, “is the information in this post (article, tweet, whatever) a potential game-changer?” If the answer to both is yes, maybe it’s time to DO something. By now you should know we care about walking and biking to school. For years, we’ve been those kookie folks trying to get our neighbors and school community on board. But stories like this give us new energy. Now that we can tie what many considered oddball behavior (“You make your kid walk to school? How interesting.“) to actual data about improved academic performance, we have an opportunity to take our passion beyond simple click advocacy. Talk to your school principal or other administrator. They have influence among parents and teachers at the school. This works even if you don’t have kids. Email the principal at your local elementary and talk about neighborhood traffic. You are a voter and your opinion does matter. Contact your elected officials. Your school board and/or write your city council and legislative representatives want to hear from you. Join a Safe Routes to School action network. Then move beyond the click with personal action! Talk to your neighbors and encourage them to walk to school and for neighborhood errands. Tell them about the study! Organize a walking school bus, or get together with other like-minded parents and start a walk and bike to school program at school. Visit a PTA meeting. Again, share you opinions as a neighbor or school parent. These are just a few ideas, but hopefully they’ll get things started. So go ahead and click like, but when it really matters follow that click by doing something! Do you have any stories about turning social media buzz into action? We’d love to hear your thoughts in the comments! This entry was posted in bikes, Human Powered Politics, kids, neighborhoods, School and tagged advocacy, bike advocacy, bike-to-school, bikes, kids, motivation, parents, School, social media, walk. Bookmark the permalink. Very thoughtful post. I am a frequent “liker” myself so I like your call to action. I hadn’t heard about the study but I’m glad it came out. We are big advocates for cyclist safety in general (no kids) which should make it better for all. Also, I know that many (most) women are moms. Although I never want kids, I want to focus my advocacy on safe cycling for FAMILIES so that women don’t keep getting left out of being able to ride. I commend your efforts in getting others to walk and bike to school. When I take my daughter to school at Wedgwood, we go via bike. Most days it feels like we’re the only ones. While it’s too late for many to adjust their schedules, those in Washington can participate every year in Transportation Advocacy Day (http://bicyclealliance.org/2013/01/14/transportation-advocacy-day-2013-lets-make-it-bigger-than-ever/), pay attention to bills making their way through the legislative process that affect bike funding and safety laws (http://bicyclealliance.org/growing-bicycling/legislation-statewide-issues/), and participate in advocacy groups, both local and statewide. I’d say this is a self-serving post since I direct the Bicycle Alliance of Washington, but as the statewide bike advocacy group we fit pretty neatly into the “doing something” category you so wonderfully highlighted here, as do other organizations. We count on social media to help us get the word out but we also use “old-fashioned” email action alerts and even older techniques like actual in-person meetings (gasp!) to bring people who bike and walk together with decision makers to tell their stories. Social media isn’t anything without stories worth sharing and those only happen when real people do real things. We are a car-free family. We homeschool our 9 year old son. He just started riding a bike solo over Thanksgiving in 2012, so we walk or take the city bus when we go places. People see us out and about. We get questions from people about being car free. I don’t know yet that we’ve inspired anyone to keep the car parked and ride or walk your errands, but maybe we will once spring rolls around. One thing that needs to be done is work to make our communities more walkable. l’ve been reading “Walkable City” by Jeff Speck. I recommend it. I would encourage our mayors and their staffs read it too.